In less than a week, I will pack my bags and head out from the Hall on an adventure. 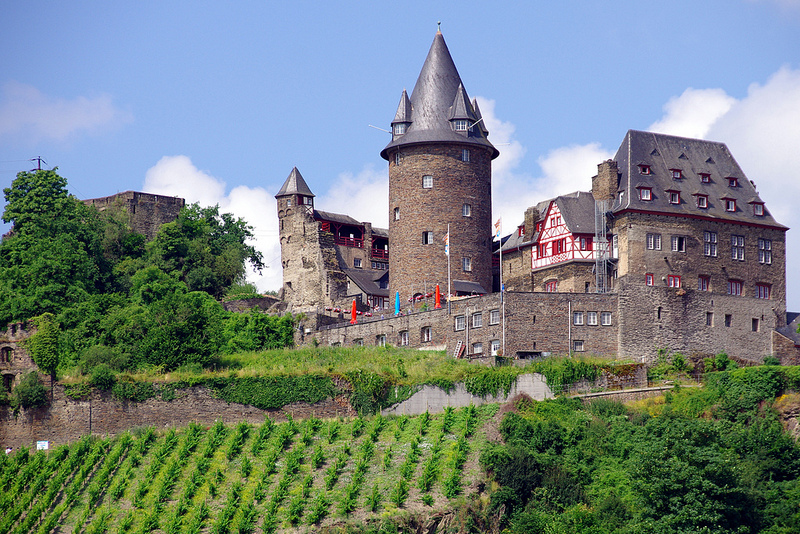 I’m heading to Castle Stahleck for the Lure of Middle-earth 2019 Convention. If I’m going to travel half way around the world to play the Lord of the Rings, it seems only fitting that I should update the Bear draft in honor of the occasion. For those unfamiliar with this format, you might want to refer to previous articles about the Bear Draft. In short, this is a limited format of the game, where eight players will sit around a table and draft hero cards and player cards in order to build their decks. The players will be split up into teams, and we will then use the new dynamic encounter sets from The Wizard’s Quest and The Woodland Realm to have each team build quests for the opposing team. Teams will then play their drafted player decks again the opposing team’s quest, with the team who finishes fastest (in number of rounds) being declared the winners. This will be the first test of this format with the new dynamic quests, and I’m excited to see how that plays out. I’m considering requiring players to reveal their starting heroes to the opposing team before the quests are built, as this can add a deeper level of strategy. At Con of the Rings last year I had a chance to play against a devilishly clever dynamic quest built by Caleb and Matt Newman, so these quests seem like a perfect fit for draft. It would have been nice if the Ered Mithin cycle was further along by this point, but the release of The Ghost of Framsburg does mean that the draft pool includes two thirds of this cycle. Dale and Woodmen should be viable archetypes now, along with a personal favorite, Beornings. The new Spirit version of Dáin is finally officially available, along with the lost Dwarven ring of power: Ring of Thrór. I’m curious to see how viable a Dwarven digging deck is in a limited format like draft. Other than an updated card pool, I took opportunity to streamline the signature card lists down to 3 cards per hero. This means that I can now offer players (at their option) the signature cards from each of their three starting heroes. In addition, I have added back Havens from v3 of the draft, which have likewise been trimmed down to 3 cards each. After drafting heroes and players cards and collecting signature cards for each of their starting heroes, players will have the option of selecting one haven as the “home base” for their deck. This gives the players three additional cards to add their decks. Havens are not only thematic (and a nice call-back to the beloved Middle-earth CCG), but they solve a growing problem with such large card pool. The game now includes many trait-specific and archetype-specific cards. In the right deck, these cards are incredibly powerful, but they are often dead cards in any other deck. A draft pool which includes too many of these niche but powerful cards and not enough generic staple cards will lead to an awkward mix of powerful and weak decks. The goal is for everyone to have a chance to build a viable deck, even with the constraints of this limited format. To this end, most trait specific cards are now Rare. This means that archetype defining cards like O Lórien! and Visionary Leadership now only have one copy each in the base card pool. This frees up space for more solid staple cards and ensures that each player has the chance to fill gaps in the decks which might be otherwise difficult to fill with archetype-appropriate cards. Even so, signature cards and havens allow players still build viable trait-specific decks. Let’s use O Lórien! as an example of how this might work. After the hero draft, each player ends up with 8 heroes and they don’t to choose which of those will be their starting heroes. Still, this gives everyone an idea of cards they might want to be on the lookout for during the player cards draft. If I draft Celeborn as one of my 8 heroes during the hero draft, I’m going to be on more likely to take powerful Silvan allies which come my way during the player draft. If I happen to see the one copy of O Lórien! in the player draft, it makes sense to go ahead and draft that – given the synergy it has with Celeborn. Still, it might be difficult to find one copy of an attachment in a 40 card deck (draft deck minimum size is smaller to account for the limited card pool). This is where signature cards and havens come into play. 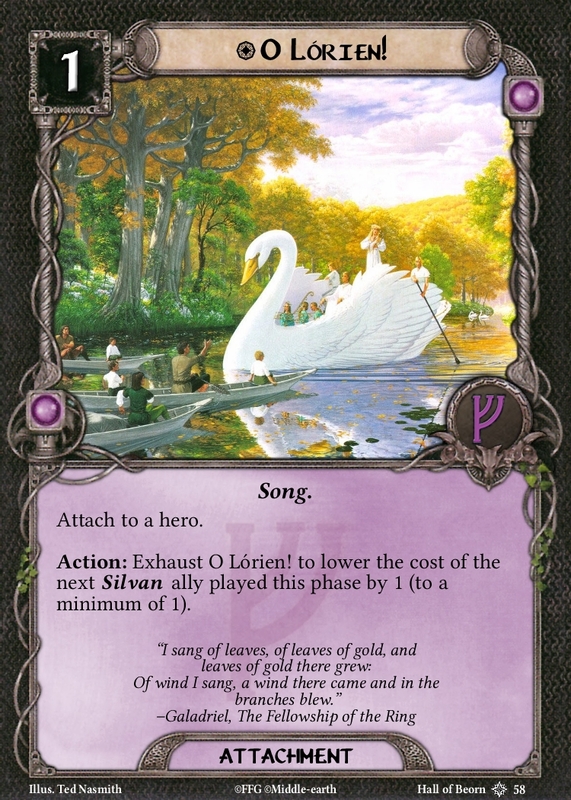 Celeborn’s signature cards are: Orophin, O Lorien!, and Feigned Voices. These three cards are an excellent start to a viable Silvan deck, and gives me my second copy of O Lorien!. If I want to go all-in on the Silvan strategy, I can select The Naith as the starting haven for my party. This grants me the following cards: Galadriel (ally), O Lórien!, and Swift and Silent. This means that it is possible to draft a Silvan deck which three copies of O Lórien! This comes with a couple of caveats. First of all, eacg haven can only be chosen by one player and players randomly determine the order in which they choose their havens. So it is possible that another player will have chosen your desired haven first. Also, each haven has requirements which must be met in order for a player to select it as their starting haven. The Naith, for instance, requires that a player has at least two heroes with the Noldor or Silvan trait. Havens are a great way to supplement heroes with commonly paired attachments, so it is not a given in the above example that I would choose The Naith. It might make more sense to use your haven choice to supplement one of your other heroes. For example, if one of your other heroes is Galadriel, it doesn’t make as much sense to choose The Naith as your haven. You can’t play ally Galadriel in a deck which already includes her as a hero, so one of your haven cards would be useless. Moreover, Galadriel is far less versatile without her ring, Nenya. I just so happens that the haven Caras Galadhon includes Nenya, Defender of the Naith, and Silvan Refugee. 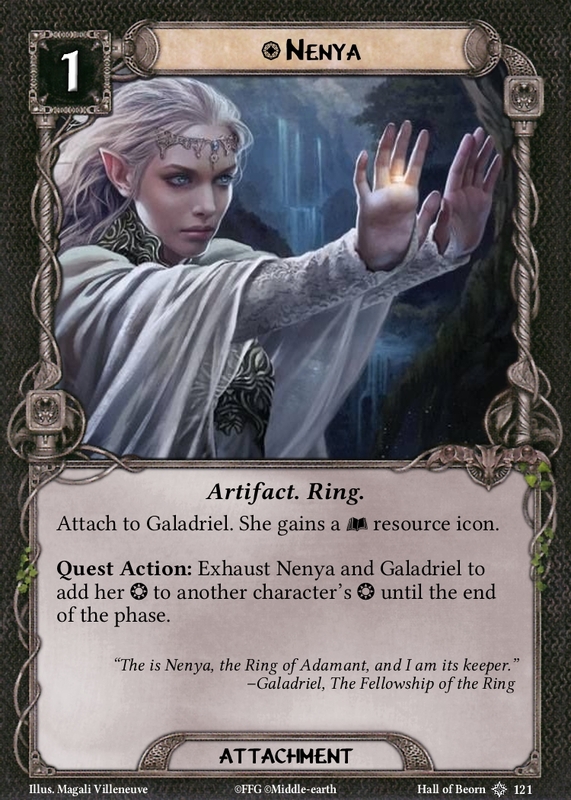 These cards not only support Galadriel, but they give you sentinel (otherwise lacking in most Silvan decks) and extra early game questing support. Below are the lists of heroes, signature cards, havens and player cards for Bear Draft v5. I look forward to meeting players for around the world, and seeing how well this latest version of the draft performs. Happy travels, fellow adventurers! Boromir: Knight of the White Tower, Visionary Leadership, For Gondor! Gimli: Erebor Battlemaster, Vigilant Guard, Khazad! Khazad! Bard son of Brand: North Realm Lookout, King of Dale, To Arms! Cards: Descendant of Girion, King of Dale, To Arms! Cards: Gamling, Herugrim, Helm! Helm! Cards: Rosie Cotton, Hobbit Cloak, Taste It Again! The Elvenking Heir of Mardil O Lórien! 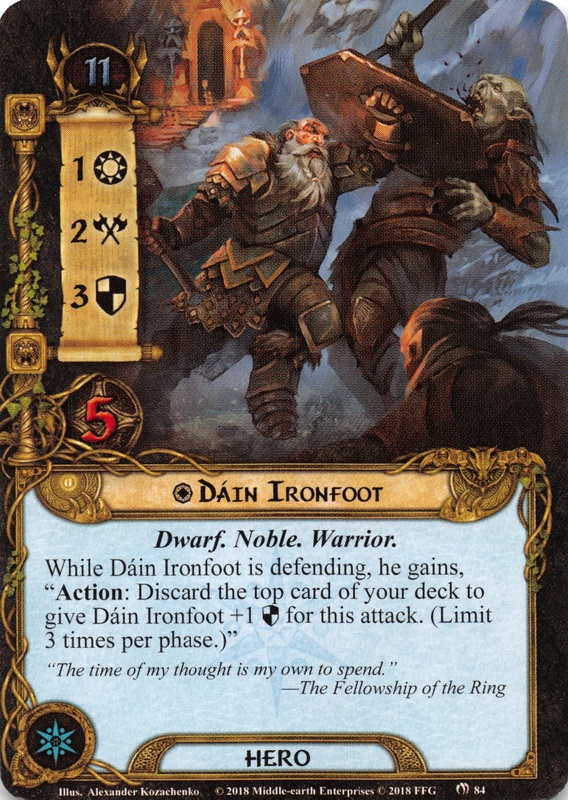 This entry was posted in Community, Draft, Game Variant, Lure of Middle Earth, Metagame, Multiplayer, Strategy, Theme and tagged Bear Draft, Bear Draft v5, Beorning, Castle Stahleck, Community, Conventions, Dain Ironfoot, Dale, Draft, Dwarven Digging, Dynamic Encounter Decks, Fantasy Flight Games, Germany, Havens, Limited Formats, Living Card Games, Lure of Middle-earth 2019, Signature Cards, The Lord of the Rings LCG, Tolkien, Wizard's Quest, Woodland Realm, Woodman. Bookmark the permalink.